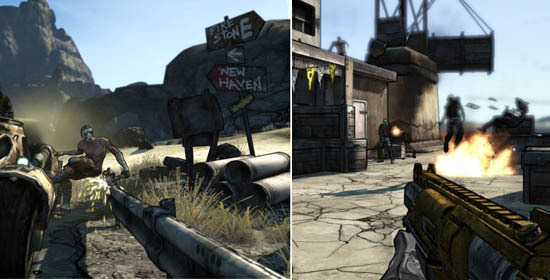 ...when I...told [husband Richie] that I was looking forward to playing [Borderlands] with him, the look on his face went from kid-on-Christmas-morning excitement to you-just-backed-your-SUV-over-my-kitten disappointment. Whoa. The last time my wife suggested playing a local co-op game with me, I promptly agreed. Normally, I'm the one asking her to join me. 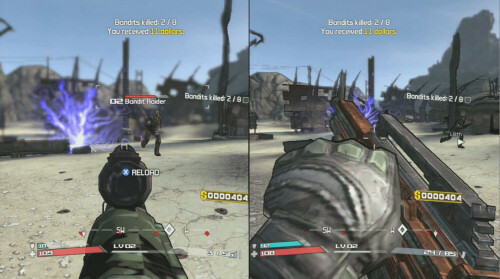 Luckily for Winda, she came up with a double solution: buy another Xbox 360 and another copy of Borderlands. Not only did this satiate her whiny husband's need for a full and unsplit viewing area, but it also allowed them to spend more time playing together regardless of whether the game had local co-op or not. Probably the most beautiful thing about this is that the new console and game combo cost them a mere $260 (a price increased to $310 if you want to include a hard drive and headset), which is extremely reasonable when compared to exorbitant marriage counselor fees. "I can't sweep under the couch right now, honey. I'm sitting on it." I'm inspired. I really am. I know that there are couples on Co-Optimus that like to game together and have already discovered the benefits of this gaming room upgrade. Why I'm not racing to the store to do the same -- in addition to this month already killing my wallet -- is because my wife isn't enough of a gamer, and I don't detest a split screen so much. But to apply this idea to something less expensive and therefore decidedly less committal (like, say: a portable system) would probably help lift the heavy atmosphere of "I have chores but I haven't enjoyed a game in four days" at my house. Because when it comes to getting nagged about house chores, there's only one better solution than getting up and doing what's asked of you...and that's enticing the nagger to shirk their chores as well.